Background Awake endotracheal intubation using the fiberoptic bronchoscope is the gold standard in morbidly obese patients. It needs special skills and high training. The disposable Airtraq laryngoscope had been used for difficult intubation. It can have some advantages compared with the fiberoptic bronchoscope during awake orotracheal intubation. Patients and methods In this study, 60 morbidly obese patients were randomly assigned to be intubated awake with either the fiberoptic bronchoscope (30 patients) or the Airtraq laryngoscope (30 patients). Time needed for intubation, the number of intubation attempts, success rate, and complications were assessed in the two groups. Results The time needed for intubation was significantly shorter in the Airtraq group compared with the bronchoscope group. As regards the number of attempts, there was a nonsignificant difference between the two groups. All patients were intubated successfully with a nonsignificant incidence of complications between the two groups. Conclusion The Airtraq laryngoscope can be used safely as the fiberoptic bronchoscope for awake orotracheal intubation in morbidly obese patients. Morbid obesity represents a great challenge to the operating room team due to dangers of inducing general anesthesia with life-threatening complications including airway obstruction, rapid desaturation, and aspiration . Morbid obesity may be associated with obstructive sleep apnea and large neck circumference with difficult intubation . Difficult airway is the clinical situation in which a trained anesthesiologist experiences difficulty with face mask ventilation, tracheal intubation, or both . The use of fiberoptic bronchoscope for difficult tracheal intubation has gradually increased. Anesthesiologists still have limited skills with awake fiberoptic intubation ,. The learning curve for intubation using the fiberoptic bronchoscope must always be developed in patients with normal airway and considered succeeded after at least 10 successful single attempts in less than 2 min ,. Airtraq optical laryngoscope is a device for routine and difficult intubation. 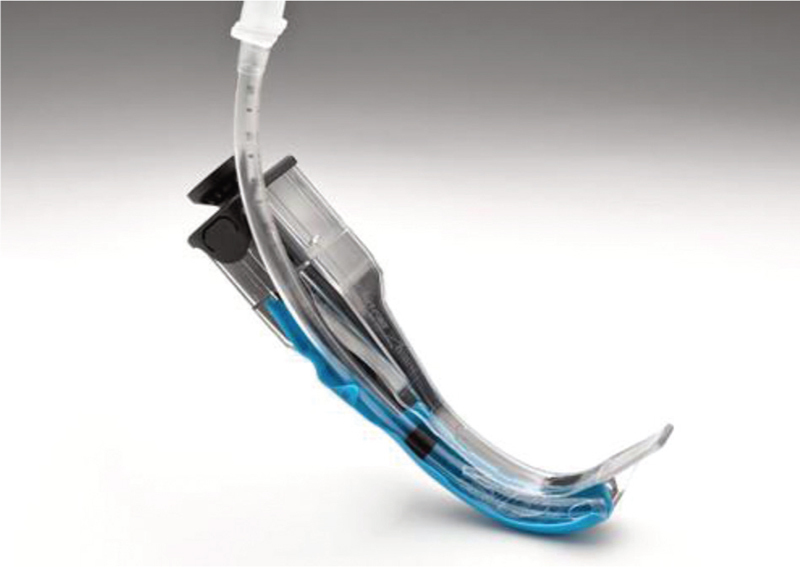 It has a curved blade with two side-by-side channels for endotracheal tube and optical system. This device affords good illumination view of the glottis with no more force applied and with no need for alignment of the oral, pharyngeal, and laryngeal axes. Awake intubation with Airtraq can be a reasonable choice for patients with difficult airway . In this study, we evaluated the difference between awake intubation using either the fiberoptic bronchoscope or the Airtraq in morbidly obese patients, and studied whether the Airtraq laryngoscope can replace the use of fiberoptic bronchoscope for awake intubation in morbidly obese patients. This study was carried out in Tanta University Hospital on 60 morbidly obese patients scheduled for elective surgery under general anesthesia. This study was performed from March to October 2015 after approval of ethical committee and obtaining informed consent from patients. Patients between 18 and 60 years of age of both sexes with a BMI of 30 kg/m2 or more and Malampati grade 3 or 4 were included. Patients who refused to participate in the study and uncooperative patients, such as those with mental retardation, lack of communication, blindness, and deafness, were excluded from the study. We also excluded any patient with indications for awake intubation other than morbid obesity, such as oropharyngeal masses, American Society of Anesthesiologists physical status IV or V, respiratory tract pathology or coagulation disorders, requirement of a nasal route for tracheal intubation, or risk for regurgitation–aspiration (previous upper gastrointestinal tract surgery, known hiatus hernia, esophageal reflux, peptic ulceration, or not fasted). Finally, anticipated impossible intubation cases were also excluded. Patients were classified randomly using closed opaque envelopes into two equal groups: group F, which included patients who underwent awake intubation with fiberoptic bronchoscope, and group A, which included patients who underwent awake intubation using the Airtraq (Prodol Meditec S.A., Vizcaya, Spain). Medical and surgical histories of the patients were evaluated, clinical examination was carried out, and routine laboratory investigations were reviewed. Preanesthetic visit was performed to explain the technique, including steps, benefits, and safety, to be sure that the patient could understand the situation, and to evaluate the patient’s best cooperation. Patients were made to fast for 8 h for solid food, 6 h for semisolids, 4 h for non-particulate juice, and 2 h for clear fluids. Antisialagogue was given in the form of glycopyrolate at a dose of 0.2 mg intravenously 30 min before intubation. The patient was attached to monitors, including pulse oximetry, ECG, and non-invasive blood pressure cuff. Patients were pre-oxygenated for 5 min through face mask at 5–6 l/min and continued during intubation through a nasal cannula at 2–3 l/min, and 50–100 mcg fentanyl was given for light sedation. The oropharynx and the supraglottic region were topically anesthetized using 15 ml of lidocaine 2% nebulization for 20 min, and lidocaine gel 5% was applied to the base of the tongue using a tongue blade 2 min before manipulation. Anesthesia was tested with a tongue blade and the response was good if there was no discomfort or gag reflex. For fiberoptic bronchoscopy, the tongue bite holder was placed in the mouth and suction of the pharynx was performed. The endotracheal tube was lubricated and placed in the tongue bite holder. The fiberoptic scope was introduced through the tube and advanced passing the epiglottis until the glottis view was obtained and the patient was asked to take a deep breath. The scope was then passed through the vocal cords and advanced until the carina. Thereafter, the endotracheal tube was advanced over the fiberscope into the trachea 3 cm above the carina. The fiberscope was then removed smoothly, the tube was fixed, cuff inflated, connected to the anesthesia circuit, and general anesthesia was induced. For awake intubation using the Airtraq laryngoscope (Prodol Meditec S.A.), the patient’s head was supported with a thin pillow in the neutral position; the endotracheal tube was lubricated and passed into the side channel of the Airtraq ([Figure 1]). The patient was asked to open his or her mouth as wide as he or she could. The Airtraq was placed in the middle of the mouth over the tongue and the blade of the Airtraq was kept in contact with the tongue until the epiglottis was visualized. If passage of the Airtraq blade into the oropharynx was difficult, crawling movements were used to move the blade over the tongue toward the epiglottis. Once the tip of the Airtraq blade was positioned in the valecula, the Airtraq was lifted straight up so as to expose the glottis. After visualization of the glottis, the endotracheal tube was advanced to the trachea; the tube was then grasped tightly and moved laterally to dislodge it from the intubation channel of the Airtraq. The tube was then fixed and the cuff inflated. Thereafter, the tube was connected to the anesthesia circuit and general anesthesia was induced, and then Airtraq was removed. Number of attempts for intubation. The time taken for intubation from application of the intubating device until inflation of the cuff and fixation of the tube. Success rate: failure was considered if intubation failed within 5 min. Grade 1: full view of the glottis opening. Grade 2: partial view of the glottis opening. Grade 3: only the epiglottis was seen. Incidence of possible complications such as desaturation (SpO2 less than 90%), vomiting, trauma, or coughing was recorded. EPI-INFO program was used for sample size calculation using intubating time as the primary outcome of this study. The α-error level was fixed at 0.05 and power was set at 80%, and the expected change to be detected was 10%. A sample size of 30 patients was found to be necessary. Data were presented as mean±SD or number (%). Comparison of two means was made using the Student t-test, and comparison of two numbers (%) was made using the Mann–Whitney U-test. A P value less than 0.05 was considered significant. This study was performed on 60 morbidly obese patients scheduled for awake orotracheal intubation divided into two equal groups: group F used the fiberoptic bronchoscope and group A used the Airtraq laryngoscope. All patients completed the study. The patients’ demographic data including the age, male-to-female ratio, and the BMI as well as the Mallampati score showed comparable data (P>0.05) ([Table 1]). As regards the number of attempts of intubation, it was one attempt in 25 patients in group F and 23 patients in group A, whereas it was two attempts in five patients in group F and seven patients in group A with a nonsignificant difference on statistical analysis (P>0.05) ([Table 2]). The time needed for endotracheal intubation was significantly shorter in group A (40±0.1 s) compared with group F [75±14 s; (P<0.05)] ([Table 3]). Endotracheal intubation was successfully performed in the two groups ([Table 4]). As regards Cromack and Lehane glottis view, it was significantly better in group F than in group A (P<0.05) ([Table 5]). A nonsignificant incidence of complications in both studied groups was observed ([Table 6]). In the present study, the main results offer support for the use of the disposable Airtraq laryngoscope as an alternative to the conventional reusable fiberoptic bronchoscope in awake orotracheal intubation in morbidly obese patients. All patients were successfully intubated when awake. The time for successful awake orotracheal intubation using the Airtraq was significantly shorter than that using the fiberoptic bronchoscope. The number of attempts was significantly fewer in the fiberoptic group and the incidence of complications was comparable in the two groups. All anesthesiologists are always afraid of the difficult airway in morbid obesity due to the development of rapid severe hypoxemia with resultant brain damage . Data from the American Society of Anesthesiologists Closed Claim Database supports this concern. ,. It was found that obese patients represented 37% of all adverse airway events occurring during anesthetic induction, and 58% of those events occurred after tracheal extubation and a large number of these situations were followed by either brain damage or death . This highlights the importance of awake intubation in morbidly obese patients. Nerve blocks of the airway can be technically difficult. Airway nebulization, although can administer higher doses of local anesthetic with unpredictable effects as solution is lost to the atmosphere, is safe and effective. Nebulization of 2 or 4% lidocaine provides satisfactory conditions for awake intubation ,. In this study we chose to perform awake intubation under topical lidocaine anesthesia preceded by antisialagogue and minimal sedation using fentanyl aiming at maintaining spontaneous respiration, abolishing the gag reflex, and anesthetizing the tongue, pharynx, hypopharynx, epiglottis, and the glottis. In this study, the use of an antisialagogue dried the secretions and allowed good absorption of the local anesthesia and good visualization. The results of this study as regards the high success rate in both groups are in agreement with previous studies ,,,,,,. As regards the time needed to complete tracheal intubation, it was longer in the fiberoptic bronchoscope group. This can be attributed to the difficulty of visualization of the vocal cords due to excess fat deposits causing airway narrowing and redundant folds of tissue. Moreover, difficulty in railroading of the endotracheal tube into the trachea lead to a longer time in the fiberoptic group ,. The fiberoptic bronchoscope is the gold standard in awake endotracheal intubation . It needs special training and it is an essential skill for use in patients with known difficult airway . It allows a clear visualization of the vocal cord and subsequent passage of a tube into the trachea under direct vision. The Airtraq, a disposable intubating device, was designed to provide a view of the glottis without hyperextension to align the oral, pharyngeal, and laryngeal axes and it does not need displacement of the tongue and needs no force to elevate the epiglottis. The antifogging effect of its lens allows its use during spontaneous respiration. The Airtraq laryngoscope had been used in patients with normal airways, in simulated difficult airways, and some case studies of difficult airway ,,,,,,. Although in this study five cases in the Airtraq group had Lehan and Cromack score of 2, intubation was performed with some manipulation of the Airtraq. This is in agreement with the work of Suzuki et al. , who had studied the use of the Airtraq for awake intubation in four anticipated difficult intubations with 100% success rate. As regards complications in both groups, a nonsignificant incidence was observed in both groups and this can be attributed to the good topical airway anesthesia, which added greatly to patient comfort during intubation. Adequate preoxygenation, the non-use of invasive techniques of local anesthesia in this group of patients with difficult anatomical landmarks and good patients’ cooperation, which is necessary for awake intubation, contributed to the lower onset of complications in this study. Compared with the fiberscope, the Airtraq laryngoscope can have some theoretical advantages. as it is cheaper compared with the fiberoptic bronchoscope and not so expensive in the situation of difficult intubation in morbidly obese patients. In addition, it is light and easy to manipulate for each step by one operator only. It was found that in some cases the weight of the camera attached to the standard fiberoptic bronchoscope often required an extra hand to hold the device during railroading of the tube (five times) necessitating a second attempt to intubate, as described leading to accidental displacement of the tracheal tube over the fiberscope. The time required for the intubation device to be ready to work is much shorter with the Airtraq without the need for adjusting the focus and the brightness ,. In contrast, a longer time is needed to prepare the conventional fiberoptic bronchoscope for use, and although experienced anesthetists can manipulate a conventional fiberscope very quickly, technical issues can be limiting. Similar problems were observed by Pandit et al. . The Airtraq is disposable when the fiberoptic bronchoscope is reusable and needs special care in sterilization and can be a source of infection. The limitation of this study may be that it was performed by experienced anesthetists. This study can conclude that the Airtraq laryngoscope can be used safely as the fiberoptic bronchoscope for awake intubation in morbidly obese patients. It can replace the fiberoptic bronchoscope in case of its non-availability or in cases of lack of experience of trained anesthetists. Berthoud MC, Peacock JE, Reilly CS. Effectiveness of preoxygenation in morbidly obese patients. Br J Anaesth 1991; 67:464–466. Juvin P, Lavaut E, Dupont H, Lefevre P, Demetriou M, Dumoulin JL, Desmonts JM. Difficult tracheal intubation is more common in obese than in lean patients. Anesth Analg 2003; 97:595–600. American Society of Anesthesiologists Task Force on the Management of the Difficult Airway. Practice guidelines for management of the difficult airway: an updated report by the American Society of Anesthesiologists Task Force on Management of the Difficult Airway. Anesthesoilogy 2003; 98:1269–1277. Erb T, Hampl KF, Schürch M, Kern CG, Marsch SC. Teaching use of fibroptic intubation in anesthsized spontaneously breathing patients. Anesth Analg 1999; 89:1292–1295. Ovassapian A, Dykes MH, Golmon ME. A training program for fibroptic nasotracheal intubation. Use of model and live patients. Anaesthesia 1983; 38:795–798. Ezri T, Szmuk P, Warters RD, Katz J, Hagberg C. Difficult airway management practice patterns among anesthesiologists practicing in the United States: have we made any progress? J Clin Anesth 2003; 15:418–422. Dimitriou V, Iatrou C, Douma A, Athanassiou L, Voyagis GS. Airway management in Greece: a nationwide postal survey. Minerva Anestesiol 2008; 74:453–458. Maharaj CH, Higgins BD, Harte BH, Laffey JG. Evaluation of intubation using the Airtraq or Macintosh laryngoscope by anaesthetists in easy and simulated difficult laryngoscopy: a manikin study. Anaesthesia 2006; 61:469–7. Collins J, Brodsky JB. Awake tracheal intubation in patients with morbid obesity. When, Why, and How. Bariatr Times 2010; 7:8–10. Williams K, Barker G, Harwood R, Woodall N. Plasma lidocaine levels during local anaesthesia of the airway. Anaesthesia 2003; 58:508–509. Rodrigues AG, Scordamaglio PR, Palomino AM, de Oliveira EQ, Jacomelli M, Figueiredo VR. Difficult airway intubatioin with flexible bronchoscope. Rev Bras Anestesiol 2013; 63:359–362. Shulman GB, Connelly NR. A comparison of the bullard laryngoscope versus the flexible fibreoptic bronchoscope during intubation in patients afforded inline stabilization. J Clin Anesth 2001; 13:182–185. Langeron O, Semjen F, Bourgain JL, Marsac A, Cros AM et al. Comparison of the intubating laryngeal mask airway with the fiberoptic intubation in anticipated difficult airway management. Anesthesiology 2001; 94:968–972. Uakritdathikarn T, Asampinawat T, Wanasuwannakul T, Yoosamran B. Awake intubation with airtraq laryngoscope in a morbidly obese patients. J Med Assoc Thai 2008; 91:564–567. Suzuki A, Toyama Y, Iwasaki H, Henderson J. Airtraq for awake tracheal intubation. Anaesthesia 2007; 62:746–747. Dimitriou VK, Zogoglanns ID, Liotiri DG. Awake tracheal intubation using the Airtraq Laryngoscope: a case series. Acta Anaesthesiol Scand 2009; 53:964–967. Kritzinger S, Grenuen MV. Awake fibreoptic intubation – the basics. Anaesthesia tutorial of the week (ATOTW201). 2010; 18th October:1–6. Maharaj CH, O’Croinin D, Curley G, Harte BH, Laffey JG. A comparison of tracheal intubation using the Airtraq or the Macintosh laryngoscope in routine airway management: a randomised, controlled clinical trial. Anaesthesia 2006; 61:1093–1099. Dhonneur G, Ndoko S, Amathieu R, Attias A, Housseini L, Polliand C, Tual L. A comparison of two techniques for inserting the Airtraq laryngoscope in morbidly obese patients. Anaesthesia 2007; 62:774–777. Maharaj CH, Costello JF, McDonnell JG, Harte BH, Laffey JG. The Airtraq as a rescue airway device following failed direct laryngoscopy: a case series. Anaesthesia 2007; 62:598–601. Black JJ. Emergency use of the Airtraq laryngoscope in traumatic asphyxia: case report. Emerg Med J 2007; 24:509–510. Pandit JJ, Dravid RM, Lyer R, Popat MT. Orotracheal fibreoptic intubation for rapid sequence induction of anaesthesia. Anaesthesia 2002; 57:123–127.